EEBA supports importing bank activity for checking, savings and credit card accounts. 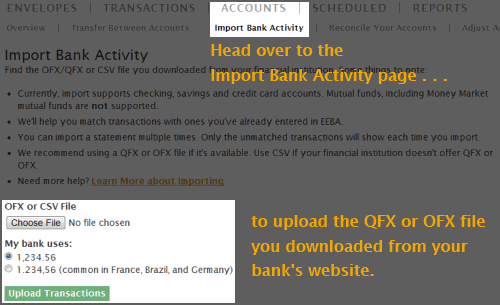 You can import QFX (Quicken) and OFX (MS Money) files, as well as CSV files as an alternative for advanced users. OFX, a.k.a. MS Money, Open Financial Exchange. “Import Bank Activity” to begin. On the review page, all your bank’s transactions will be on the left, and all of EEBA’s existing transactions on the right. EEBA will match similar transactions in green (exact matches), or yellow (best-guess matches). Unmatched transactions will be in grey. Review the matches in EEBA to make sure they’re correct. You can cancel a match by clicking on the “X” in the middle column. To manually match two transactions, drag and drop the imported transaction over the EEBA transaction you want to match it with. To create a new transaction, drag the imported transaction over one of the Envelopes shown at the bottom of the page. “Manually Created” transactions will be in blue. Once you’re done, click on “Save Changes” at the bottom of the screen. Congratulations, you just imported your bank statement! Will the matched transactions be counted as reconciled? Matched transactions are actually marked as “Cleared”. Then, when you run the account reconciliation and enter your starting and ending balances, you’ll have a chance to finally convert them from cleared to reconciled. I can not find the import buttin/ option anywhere, please help. Hi Sarah, make sure that you’re visiting the website on a desktop browser. Then go to the Accounts tab and look for “Import Statement” in the submenu. We hide this particular functionality in the mobile version of the website because importing uses some drag-and-drop functionality which doesn’t work well on touch screens. If you *are* using a desktop browser but still don’t see the “Import Statement” link, we’ll need a bit more information about your browser so that we can figure out why we are auto-detecting it as a mobile browser.